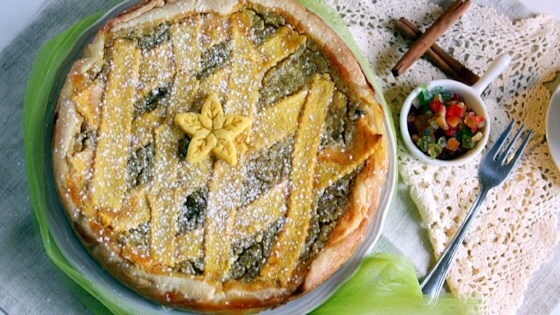 "Pastiera is among the most iconic of Italian desserts. Originally from Naples, it's most typical during Easter season, but it is served year around. The traditional filling is made of cooked wheat berries and sheep's milk ricotta. [Recipe originally submitted to Allrecipes.it]"
Combine cooked wheat berries, milk, butter, and zest of 1 lemon in a saucepan over medium heat. Cook, stirring often, until creamy, about 10 minutes. Remove from heat and let cool. Preheat the oven to 400 degrees F (200 degrees C). Grease an 11-inch springform pan or aluminum pan and line with one of the pastry crusts. Combine ricotta cheese, sugar, eggs, egg yolks, 1 tablespoon orange flower water, vanilla extract, and cinnamon in the bowl of a food processor; mix until smooth. Mix in remaining lemon zest and orange peel. Fold in wheat berry mixture and pour over the bottom crust. Roll out remaining pastry crust and cut into 1/2-inch wide strips. Place on top of the pie in a lattice pattern and brush with beaten egg. Bake in the preheated oven until filling is cooked through and top is lightly browned, about 1 hour. Remove from oven and place on a wire rack. Cool for about 30 minutes. Remove pie carefully from the pan and place on a serving plate. Dust with confectioners' sugar. Cakey, almond-flavored frosted butter cookies. You can also use citrus peel instead of orange peel.